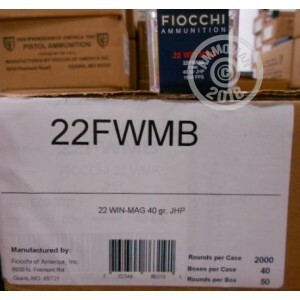 A .22 WMR rifle loaded with this Fiocchi hollow point ammunition will make short work of pesky critters. These American-made cartridges come in plastic 50-round boxes and fire a 40 grain jacketed hollow point bullet at 1,910 feet per second. This high muzzle velocity creates explosive expansion and fragmentation upon contact with a target. Those varmints will never know what hit them! Getting a hold of rimfire ammo can be a bit of a chore if you procrastinate. Instead of going on snipe hunts, why not place an order at AmmoMan.com? We'll even throw in free shipping if your order total exceeds $99.